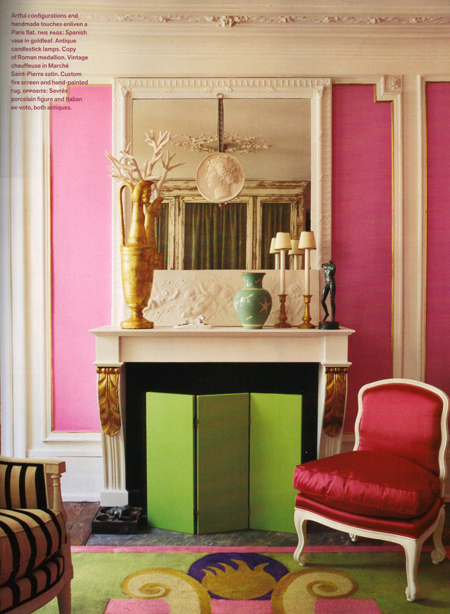 Pink walls can look amazing, as seen in this room by Roberto Bergero, published in April's issue of Veranda. The bold color against the intricate white molding is striking. Though I don't think I could go this bold in my own home, I am always drawn to strong hues of pink. To me, this particular shade of hot pink is executed so well because it is balanced with very traditional elements, which keep the look modern. Beautiful! Hope you had a lovely 4th of July. i love a bold pink. not sure i could commit to it on walls, but fabrics and accessories? for sure.